We have always considered ourselves more carnivores than herbivores here at We Ate That. However, we have been making the adult change and started to incorporate more salads into our meals. We have never been big fans of traditional lettuce and for a time the only green leafs that we would eat was baby spinach. After trying a few other greens we identified Arugula as our favorite salad leaf. It has a nice peppery flavor and works well with numerous vinaigrettes. We especially like how well it works with fruit. Our current salad trend as you may have noticed is eating salads that include fruit. We feel that it helps the greens go down and makes eating salad more enjoyable. 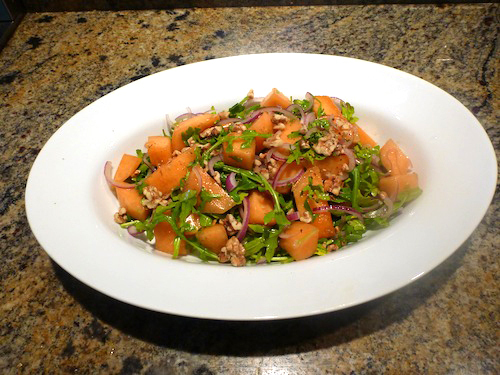 As a result we have been looking for new salad recipes and found one that combine both Arugula and fruit, it is a cantaloupe, red onion and walnut salad. To make the vinaigrette, combine the orange juice, lemon juice, and raspberry vinegar in a small bowl. Slowly add the olive oil, whisking constantly until the mixture is smooth. 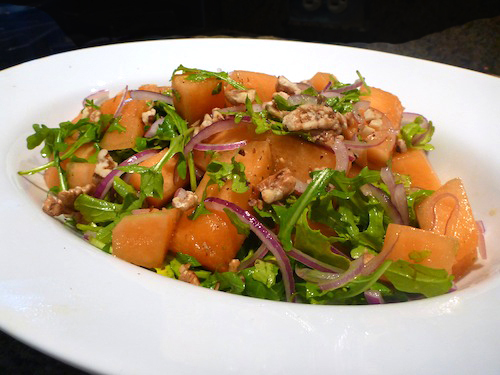 To make the salad, combine the cantaloupe, red onion, arugula, and 1/2 cup of the walnuts in a large salad bowl. Garnish with the remaining walnuts. This salad has little bit of everything in it. The Arugula provides a nice strong pepper flavor, which is nice compared to tasteless traditional salad greens. 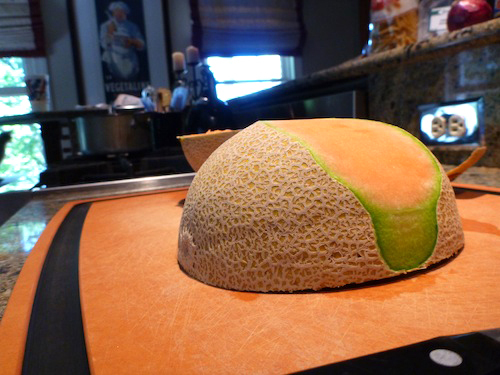 The cantaloupe adds an intensely sweet flavor that works well inconjunction with the Arugula. 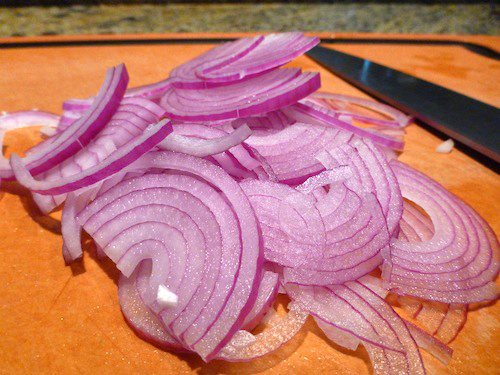 The red onions provide a level a crunch to this dish as well as a bit of spice. Then the salad is finished off with toasted walnuts, that like the onions add a nice crunch. Everything comes together with the orange vinaigrette which is full of great citrus flavors thanks to the freshly squeezed orange and lemon juice. The vinegar also provides another depth of flavor to the vinaigrette. This salad is sophisticated enough to impress those with a refined palate and is still accessible to even the pickiest of eaters. You may even get your kids to eat some. This salad is a Should Eat, it is a great salad for those people just dipping their toes in the salad arena. It is a light salad that would be the perfect start to any summer dinner on the porch. This salad should please all members of the family and is worth making, especially right now when cantaloupe is at its height of ripeness.